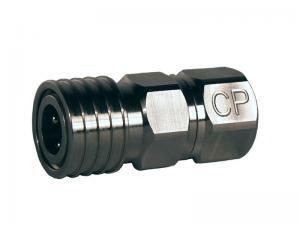 CP's distinctive quick disconnect coupler is now available with a check valve. Perfect for use with fill stations, the check valve holds back HPA pressure in the line until a fill valve is properly connected to it. Engineered to be durable and reliable, it is also rebuildable. Standard 1/8" NPT threads on female side. Made in USA.